Research indicates that women are most likely to tell the father of their baby about an unexpected pregnancy. A woman's decision about the outcome of her pregnancy is often influenced by the health of her relationship with the baby's father and whether he welcomes the pregnancy. Is your center prepared to influence the man who is influencing your pregnant client? Care Net has assembled some of the best practices for serving men in pregnancy centers in one convenient eBook. Understand the cultural realities men face. Learn strategies for gender inclusivity in the center. Topics include:marketing to men, coaching men, and program funding. Download today and enhance your programming for men and fathers. 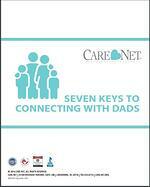 Download "Seven Keys to Connecting With Dads" Today!